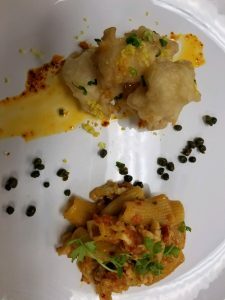 If you love seafood and you love pasta, then this dish is for you! 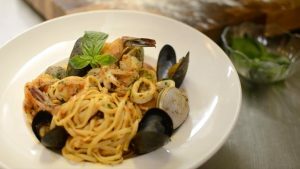 Find the freshest shellfish available at the local market and you’ll prepare a delicious pasta entree, frutti di mare, (translation:”fruit of the sea”). This is definitely an impressive dish for a special occasion! If you are not a fan of cod, other fish may be substituted for the cod. Allow yourself to get creative, or try the recipe several times with different fish. There are no hard and fast rules when it comes to the seafood ingredients. Regardless, you’ll feel as if you’ve been transported to the coast of Italy! Mangia bene’! Heat oil in a large sauté pan over medium heat. Cook garlic until it begins to sizzle. Add red pepper flakes to taste; cook 1 minute. Add clams then wine cover and raise heat to medium-high; cook 5 minutes or until clams begin to open do not evaporate liquid, keep moist. Add PASTA REA Frutti Di Mare Sauce, shrimp, scallops and cod, bring to simmer and cook until shrimp and fish are just done. Add linguine to boiling water. Cook until al dente. Uncover sauté pan; simmer 1 minute more, season with salt and pepper. Cook, stirring, making sure clams and mussels open, about 3 minutes. Toss with linguine. 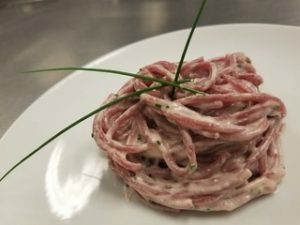 Bucatini, the thick spaghetti-like pasta with a hole running through it is the perfect pasta for Bucatini all’Amatriciana, the simple, flavorful tomato sauce which legend has it is from the town of Amatrice in Italy. 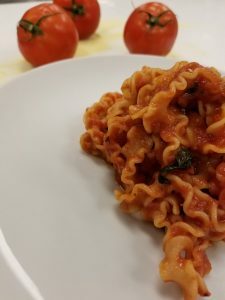 The noodles (which by the way, the word bucatini comes from the Italian word buco, meaning “hole”) soak up the flavorful sauce and what many people love is the fact that the sauce actually runs through the hole, imparting additional flavor. 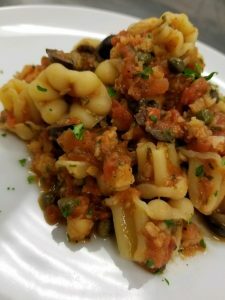 Enjoy chef’s recipe – it is one of his favorites and his children love it! What kid wouldn’t love spaghetti with holes? Heat oil in a large heavy skillet over medium heat. Add guanciale or pancetta and sauté until crisp and golden, about 4 minutes. Add red pepper flakes and black pepper; stir for 10 seconds. Add PASTA REA Marinara, reduce heat to low, and cook, stirring occasionally about 15-20 minutes. Add drained pasta to sauce and toss vigorously until well coated. 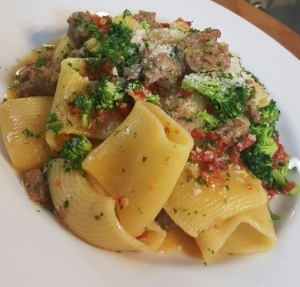 Rigatoni with Broccoli Florets and Sausage is one of chef’s favorite pasta dishes and he has graciously shared his recipe so you can prepare it at home for family and friends. 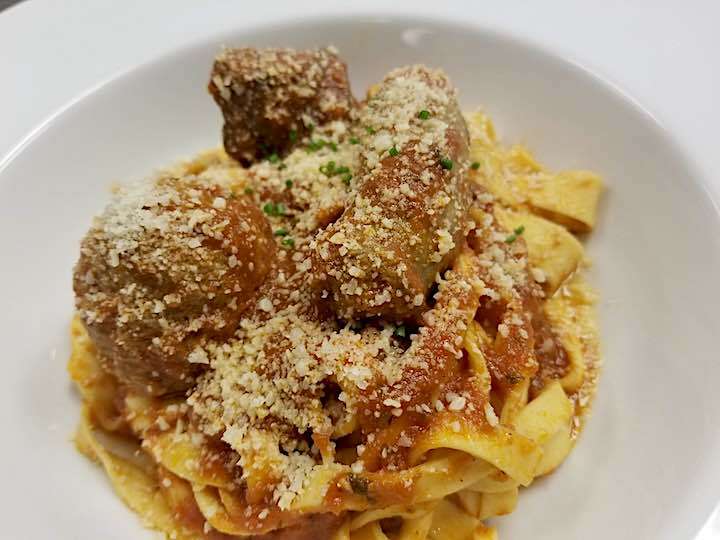 Our fresh rigatoni is available at the Uptown Farmer’s Market on Saturdays or you may call to place an order for pick-up at our kitchen. We’d love to hear from you so let us know how you enjoyed this recipe! 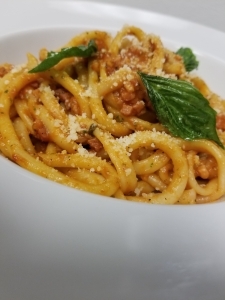 Pasta Fra Diavolo has enough “fire” to ignite the passion for Valentine’s Day! 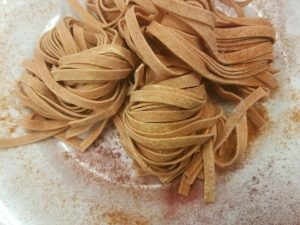 Chef shares his recipe for Pasta Fra Diavolo. Serve with our cured tomato, red beet, and chili tagliatelle or pasta of your choice. With a sharp pair of scissors cut down the center of the bottom of the lobster tail. Separate shell with fingers and remove tail meat. Cut into ¼ pieces. 9. Plate evenly in 2 portions, serve immediately. We receive a lot of requests for meatless meals. We think you’ll enjoy Chef’s Cheese Cannelloni recipe. Serve with a Caesar salad or mixed greens and you have a delicious meatless meal. 1. Heat oven to 325 degrees. 2. Lay out pasta sheets one at a time on a flat surface with the shorter side facing you. 3. Fill a pastry bag with PASTA REA Ravioli Cheese mixture. Do not use a pastry tip. 4. Pipe in about 3 oz. of Cheese mixture in an even line from one side to the other. 5. Roll pasta over the cheese to form a cigar shape tube then cut. You should end up with 2 each 6.5” tubes per pasta sheet. 6. Repeat this process using both spinach and egg pasta sheets resulting in 6 each spinach and 6 each Egg cannelloni 6.5” long and about 1.5” thick. 7. In a 9 x 9 baking dish ladle 6 oz. 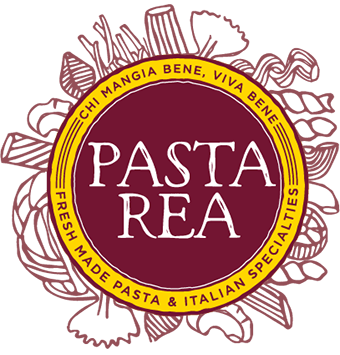 of PASTA REA Vodka sauce. 8. Place 3 spinach and 3 egg cannelloni on top of sauce alternating colors. 9. 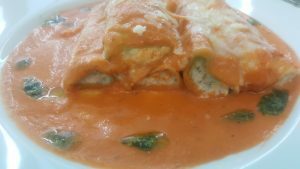 Top cannelloni with 6 ounces of PASTA REA Vodka Sauce. 12. Cover with plastic wrap then foil. 13. Bake in 325 degree oven for 35 to 40 minutes until sauce bubbles on the side. 14. Remove wrap and foil and bake to melt top layer of cheese, about 5 minutes. 15. Remove from oven and allow to cool for 5 minutes. 16. Cut into 4 or 6 portions. 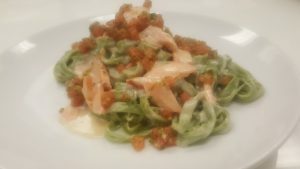 Place a portion on each plate and garnish with Romano Cheese and a drizzle of PASTA REA Basil pesto.